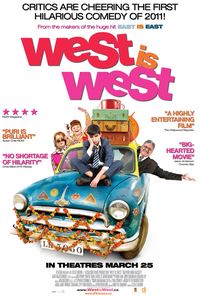 West is West is the sequel to the hugely successful 1999 film East is East, about a Pakistani man, George played by Om Puri, who runs a chip shop in Salford in the early 70s. 'West Is West' turns out to be the kind of film that just about manages to pass muster without making you feel overtly engaged with the characters or empathising with them. Also, it doesn't have the kind of humour which would result in audience spreading a strong word of mouth. However for a select urban audience hunting for a kind of film which looks and unfolds differently from a regular Bollywood flick, 'West Is West' makes for a lazy one time watch. If the writer hadn't experienced it first-hand, West is West may have lost some of its realness that makes it endearingly relatable.